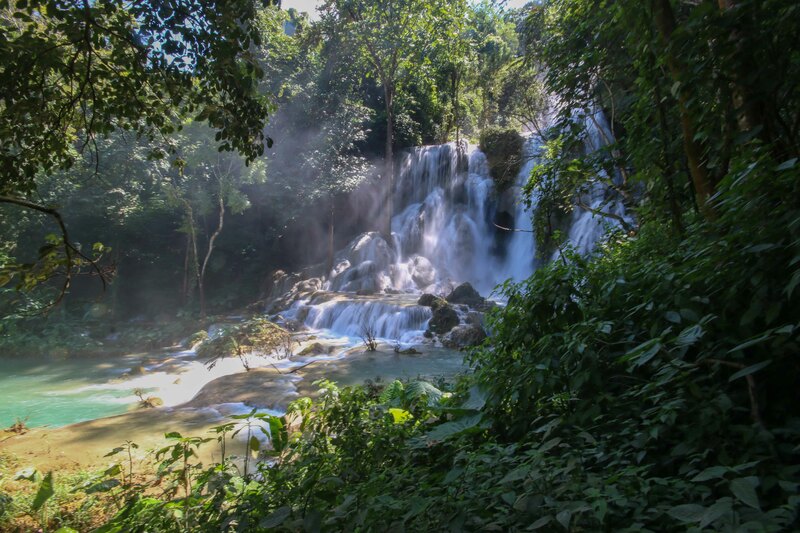 I have to admit my expectations of Kuang Si Waterfalls were low when I jumped into a minivan packed full of tourists in Luang Prabang, ready to make the windy journey 30 kilometres into the rural surrounds. Easily accessed natural wonders so often become overrun with souvenir stalls that detract from their wild state and when we pulled into a carpark of that exact scene I felt like i was going to be left disappointed. But after paying my entrance fee I followed the track that led through the jungle, opening out into a Moon Bear refuge sanctuary where wildlife rescued from poachers had been brought. In my lack of research about Kuang Si I had no idea that this existed and not only was the signage educating visitors about the bears and their plight insightful but the bears wallowing in their new found freedom were highly charismatic. 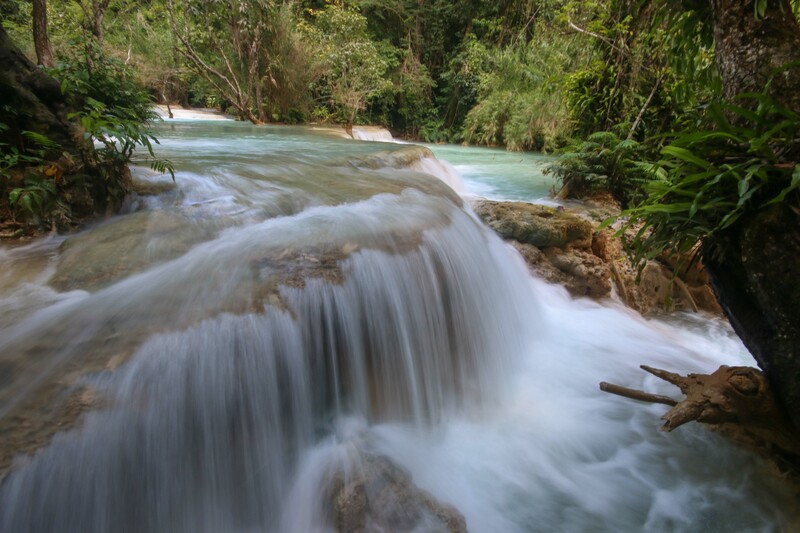 The path continued on to my first glimpse of the lower travertines of Kuang Si that disperse and cascade into turquoise swimming holes, surrounded by lush vegetation. Despite large numbers of other tourists, there were plenty of places to escape, dip your toes and just take in the beauty of it all. 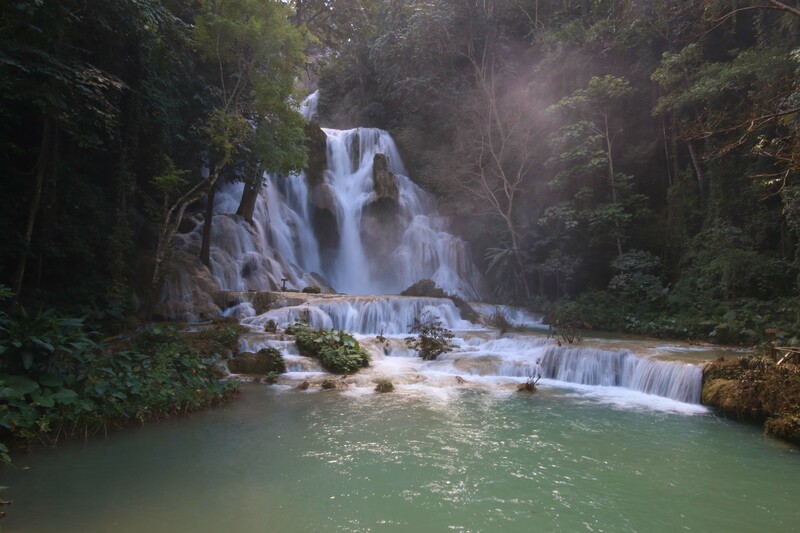 The path follows the river upstream through a number of cascades before you encounter Kuang Si itself – a spectacular body of water that falls dramatically over the cliff face, sending off a large cloud of spray that showers its visitors. 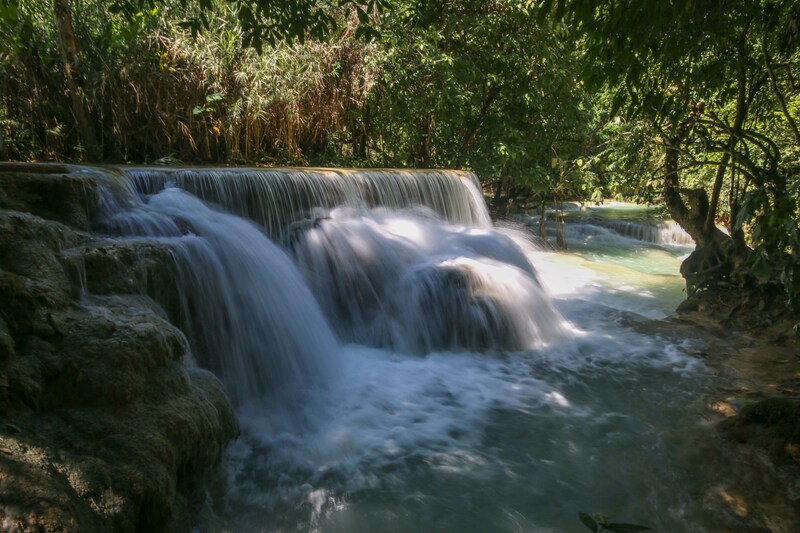 While there is a precarious path that leads up the right side of the falls to its top, it was incredibly slippery as a result of the rains and I decided that instead of coating myself in mud I would linger a little longer in Kuang Si’s idyllic swimming holes!